At 5,003 feet above sea level, Fort Collins is a city hugging the foothills and growing east towards the plains. Populated with over 150,000 people, Fort Collins is constantly growing. Known for its craft beer, Colorado State University, and unique lifestyle, this city thrives on the new and old coming together. Old Town is one of the epicenters of the city’s culture, due to the multitude of specialty shops, artisan galleries, and restaurants catering to the diverse population. Another attractive feature of the city is the close proximity to the mountains. 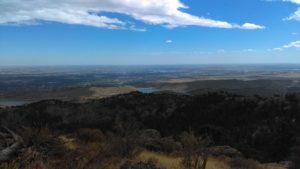 A short drive can get you to Horsetooth Rock or the reservoir below sharing its name. From the mountains, the Cache la Poudre River flows through the city with the spring runoff. Further, into the mountains, the Rocky Mountain National Park is an hour’s drive away. Many famous ski resorts nestled high on the snowy caps are a few hours drive from the city, which encourages outdoor sports. The dynamic economy matches the significant presence of international technology companies like HP, the growth of micro and macro breweries, and regional-serving medical facilities. Fort Collins is a city mixed with the new and the old, nature and technology. The city itself has received nation-wide recognition for various achievements, such as being in the top 20 of the 100 Best Places to Live in 2017 and 2018. Other awards include Best Places to Raise a Family, Best Performing Cities, and #1 City in America for Cycling. Due to the geographic location, national fame, and constant change, Fort Collins is desirable for buyers and investors. Many people want to make a home stand out or create their dream home. Renovations are common choice because it can increase your home’s value or help find a new tenant. For such projects, easy and manageable waste removal is something Dumpster Rental can provide. Dumpster Rental can provide you with various dumpster sizes and deliver to your place. Whether your home or business is in an open lot or has a small alley, Dumpster Rental can maneuver the dumpster wherever you need. Dumpster Rental is a local company ready to assist you in your renovation adventure. 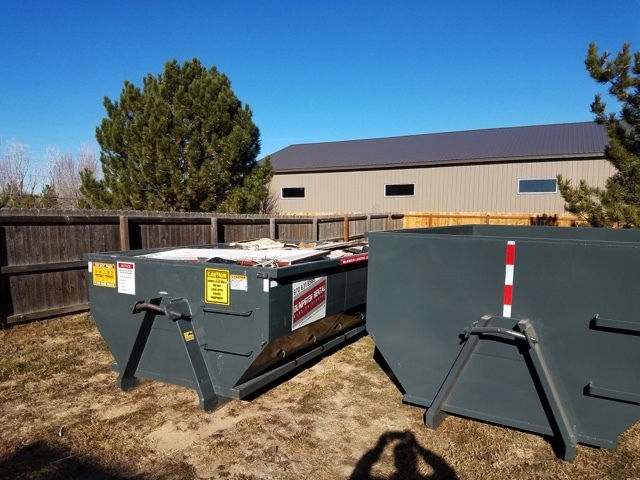 Originally a dumpster company of the 1990’s in Colorado Springs, Dumpster Rental moved their business to Fort Collins in 2012. Since then, they have been serving Fort Collins and the surrounding areas with a passion. Dumpster Rental has been assisting the community with renovations, remodels, landscaping, house cleanups, and so much more. If you see a project like these in your future, consider using the local service of Dumpster Rental to save you time and money. Reduce, Reuse, Recycle. This mantra is drilled into us and our children over the years as we have become more aware of our environment and turning ‘trash’ into ‘treasure’. Whenever you begin your construction project or emptying out your house, your goal is to get rid of as much waste as you can. Dumpster Rental provides services for you to get rid of the your project’s trash. However, what about recyclables? In particular, items like plastic bags, bottles, electronics, and furniture. 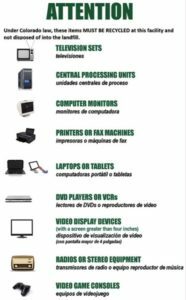 Dumpster Rental can assist you with recycling your items, but there are opportunities where you can recycle. 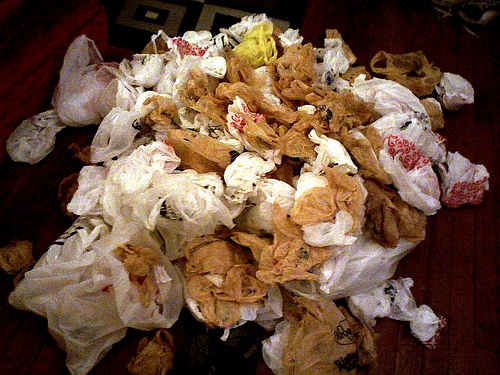 Plastic bags like grocery bags should not be put in the dumpster along with your waste. Instead, Fort Collins and the surrounding area provides places for you to drop off plastic bags. King Soopers stores around town have bins specifically for recycling plastic bags and film, usually found in the front entrance. Below is a list of sites that accept plastic bags along with other recyclables such as aluminum cans and #1-#7 bottles and jars. For more specifics on what each recycle site does, check here. Other sites around town have similar bins and centers that accept different items meant for recycling, such as electronics. 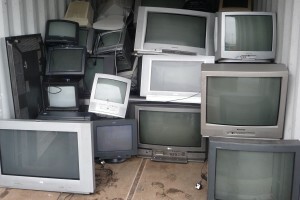 Electronics like TVs and phones can be accepted by Dumpster Rental due to a Colorado Senate Bill. Many major businesses such as Best Buy, Target, Verizon and more will accept old electronics regardless of their usability. There is another option if you have bigger items like chairs, tables, or couches you want to get rid of. If they are in acceptable condition, various second-hand stores will take your unwanted items as donations. 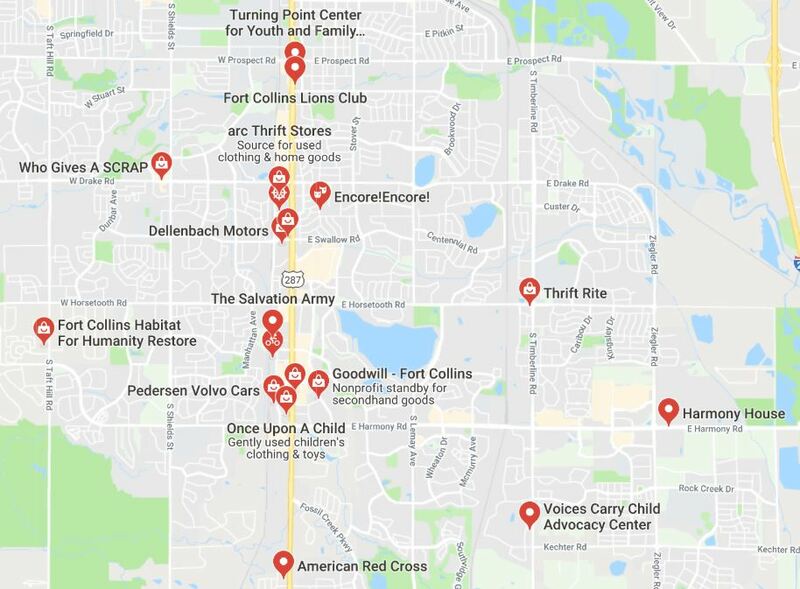 Such places include Goodwill, Fort Collins Habitat for Humanity Restore, arc Thrift Stores, and Thrift Rite. Construction sites can be a mess, whether it is for a new business remodel or a home addition. Managing the mess you make is necessary for peace of mind and a smooth process. For such construction projects, a roll-off dumpster is an easy way to get rid of your waste. In addition to having a roll-off dumpster, there are various tips and tricks you can utilize in order to make your dumpster use as painless as possible. The most important piece in preparing for your construction project begins with the placement of your roll-off dumpster. All dumpsters available from Dumpster Rental can fit in most drive ways. It is the details that you consider later that are the most important. One such detail is whether you want the door of the dumpster to open? Do you want the door completely open, or only partially? Are there any obstructions at your construction site or driveway that could hinder the door opening? Do you want water to drain a certain direction? These are the questions you must ask yourself in order to start your project on the right note. If there are any special instructions you have for your dumpster drop-off, please make sure to note that in your contact form. Quick Tip: If you are disposing an empty five gallon bucket, fill it with something first so you avoid paying for empty air. Now it is time for the dirty work as you begin to fill the dumpster. Here are some additional tips that can make your construction project and your life easier. Create a ramp system– If you have the door open, a ramp system will allow you to wheel in heavy material to the back of the dumpster, instead of waste piling up at the front end. This is best for construction waste like tile, mortar, and plaster. Stack orderly- You may just want to throw your debris away and keep moving, but that can waste valuable space. Large flat material such as drywall and plywood should lie flat on the bottom. Other material like long boards and planks should be oriented parallel to each other. Landscaping waste– Due to the light, compressible nature of leaves and grass, put this material towards the bottom of the dumpster. Heavier materials like branches should go on top in sizable pieces, all lined the same direction. Construction is often dreaded as a harsh task, despite the glamorous outcome. By considering the information above, you can make your construction project more manageable, safe, and orderly. After all of your meticulous planning, it is finally time. Demo will soon begin, moving day is coming, or a major cleanup will be a significant part in next few weeks of your life. Contractors, permits, everything appears to be in order. That is, until you consider how to deal with the amount of waste your project will generate. A roll-off dumpster is a wonderful solution. However, you must make one more decision: what size do you need? What do my options look like? Dumpster Rental provides three sizes you can choose from to fit your various project needs. 8-yard Dumpsters are a great fit for simpler projects, such as clearing a garage, disposing yard waste, and smaller home remodels like bathrooms. The dimensions come in at 12 feet long by 8 feet wide by 4 feet high. There is plenty of space for whatever you need to discard, at a comfortable height to throw material over the side. 10-yard Dumpsters are slightly larger than the 8-yard option, made for projects of a slightly larger nature. Large house clean-outs, small commercial jobs, and medium house remodels are only a few possible projects this size can accommodate. Coming in at 12 feet long by 8 feet wide by 4 feet 6 inches high, this dumpster is a heftier version of the 8-yard, able to handle large debris such as timbers from your old deck, while still at a comfortable height. 15-yard Dumpsters are your best choice for major projects, such as new construction, large-scale remodels, or large cleanups. This dumpster has much more volume compared to other dumpster options. The dimensions are 12 feet long by 8 feet wide by 5 feet 6 inches high. Being so large, there are no worries about filling this dumpster with everything you don’t want.